Here pairs of small lively peacocks stand facing each other underneath trees stylised in similar fashion to those on the previous fragment [EA1984.508]. Again, there are two bands placed so that one is a mirror-image of the other. The stitch is the same as No.3 [EA1984.508], but on this piece split stitch is used both for outlining and filling in the shapes of the little peacocks with red, blue and yellow silk, which has now faded. Birds were not the only creatures chosen to decorate this category of early Fatimid embroidery. On another piece in the collection, four-footed creatures with raised left front paws, possibly lions, stand against a blue background. On yet another there is an elephant that must have once looked splendid with its pink head and legs, yellow body and large eye. These embroideries are most probably from furnishings. From documents recovered from the Cairo Genizah, a collection of medieval Jewish traders' documents found in the synagogue in Old Cairo, we learn that ten linen cushions were part of the dowry of a bride recorded about A.D. 1020. 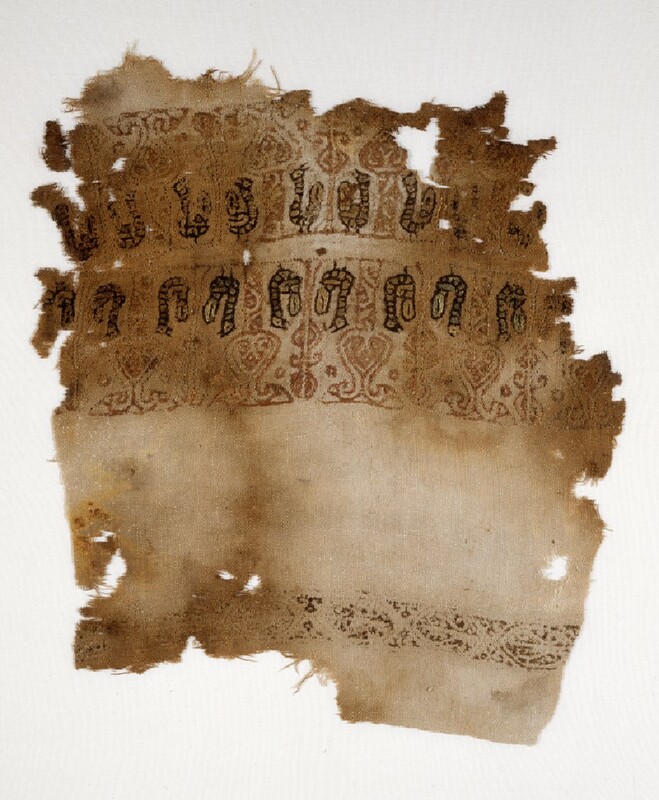 Although some of the Newberry fragments are sadly worn, enough have survived to give us some idea of the colourful embroidery that once brightened Fatimid homes. A double band with a repeating design of tall plants alternating with pairs of confronting birds standing at the foot of a heart-shaped tree; remains of narrow band of hexagons. 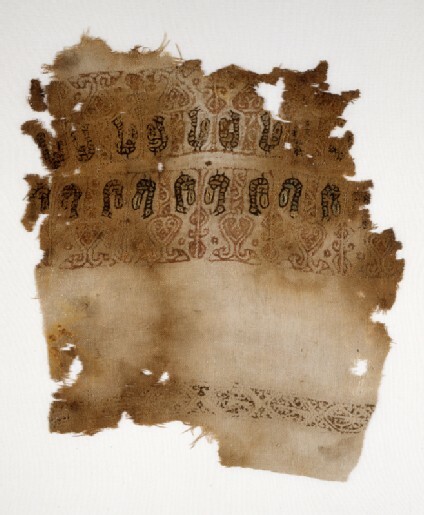 Kuhnel dates a similar embroidery to the 12th/13th century.